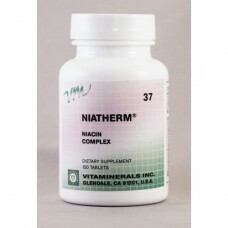 Niacin is an effective vasodilator which increases blood flow and circulation. It works by relaxing smooth muscles that line the walls of blood vessels -- causing the blood vessels to increase in diameter and allow blood to flow through more easily. An increase in blood flow and circulation helps promote cell growth and organ function. Vitamin B6 - also called pyridoxine helps the body make several neurotransmitters, chemicals that carry signals from one nerve cell to another.